Prelude: This time around Megatron was the first figure of a new toy line to be sighted on the internet. It was but a short time after the shooting for the movie started that we learned that Megatron would be a truck this time around and the first images weren’t long in coming. One thing to keep in mind, though: This version here isn’t the final version of DOTM Megatron. The one that will be available in retail – as we saw on the New York Toyfair – will have a far better and more realistic paint job. Alternate Mode: Megatron is based upon a Mack M915 military truck with a tanker trailer. A kind of camouflage net has been hung over the trailer, which will play an important role in robot mode, but more on that later. The trailer is connected to the truck on a slightly posable hinge, making Megatron the first Movie toy that has posability in vehicle mode. Very nice! On a personal note, I think this mode is the perfect choice for Movieverse Megatron, much better than the two Cybertronian modes he had in the previous movies. 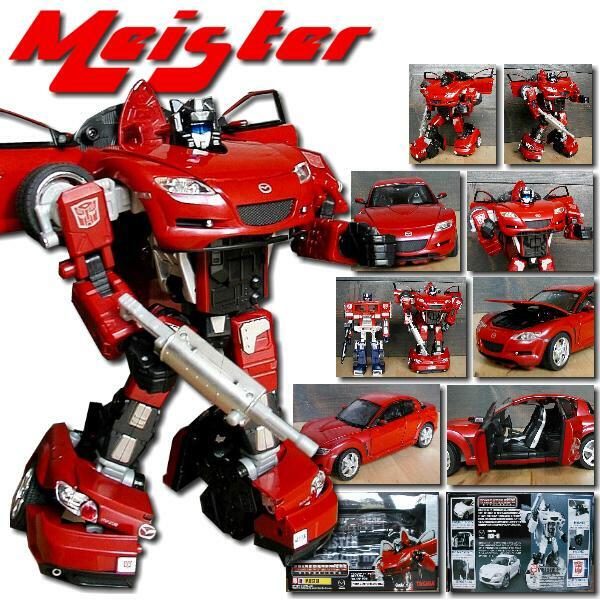 According to the plot of the DOTM computer game Megatron acquired this vehicle mode in Africa, seeing as he was no longer flight-capable after the battle with Optimus Prime. We’ll see ff this is how it’s going to be in the movie, too. Robot Mode: The moment many Transformers fans have been waiting for: Megatron finally becomes mysterious and sinister instead of just brutal. The most important element is, of course, the cape hanging over Megatron’s head and shoulder, which hides his disfigured face. The cape does somewhat hinder the posability of his left arm, but that’s not a big thing. On the right arm we have the fuel tank which transforms into Megatron’s fusion cannon. Not all that innovative, but fitting. Interesting detail here: You have to activate the MechTech Gimmick in order to make the look fit. More on the later. The downside here is that Megatron has turned out pretty small. Compared to his Movie 1 and ROTF versions he is downright tiny, despite now being about Blackout’s size (see head size). In terms of posability, though, absolutely no complaints. Gimmick: The Voyager class clearly has an edge when it comes to the MechTech weapons, because so far these are the only figures where the transforming weapons can be integrated more or less smoothly into the vehicle modes. Also, they are the only ones I’ve had so far where no modification is necessary in order for them to remain affixed in action status. Nicely done. Conclusion: A great figure, a great concept, just too small. A Leader- or even Ultimate-class variant would have been better in my opinion. Just add a few modifications and you get a Scourge or Nemesis Prime.